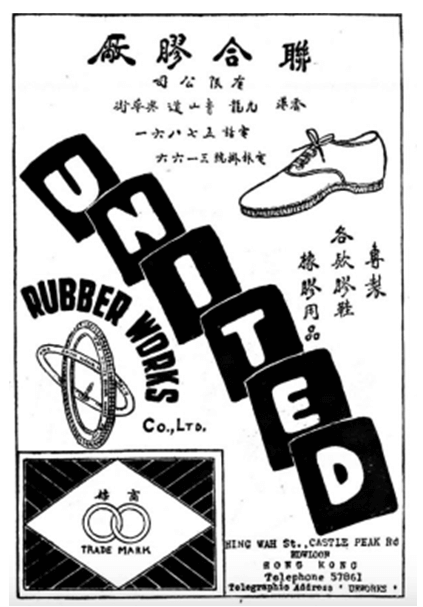 United Rubber Works was one of the five biggest rubber product manufacturers in HK in the late 1940s with ties to several figures discussed earlier in different articles. Formed in 1946 (although the firm was not incorporated until March 1947) with HK$1 million in capital contributed by at least three weaving mill owners who were profiled earlier – namely Ng Yue-kwong of Ng Yee Hing, Shum Choy-wah of Kow Yue and Ngai Siu-hung of Yuen Hing, the mastermind behind the firm was its managing directorFok Kam-sek (霍金石), who like Pang Kam-wing and Fung Yat-hing of Continental Rubber Manufactory was a former executive at Fung Keong Rubber Manufactory, the 800 pound gorilla in the industry. The firm’s factory was located at 15-21 Hing Wah Street at the intersection of Castle Peak Road in Kowloon next to a hotel and it manufactured rubber shoes and other rubber products. Like Fung Keong, Fok was a native of Wan Fou (Fung Keong’s wife also shared the last name of Fok so it is possible they were also relatives) and was born in around 1906. He joined Fung Keong and the rubber industry in the 1930s and by 1938 was managing director of Fung Keong Rubber Manufactory in HK. At its peak in the late 1940s, United Rubber Works was producing 10,000 pairs of rubber shoes and 4,000 pairs of rubber boots per day but due to weakness in the industry was only producing 3,000 pairs of rubber shoes and 1,500 pairs of rubber boots as of August 1948. 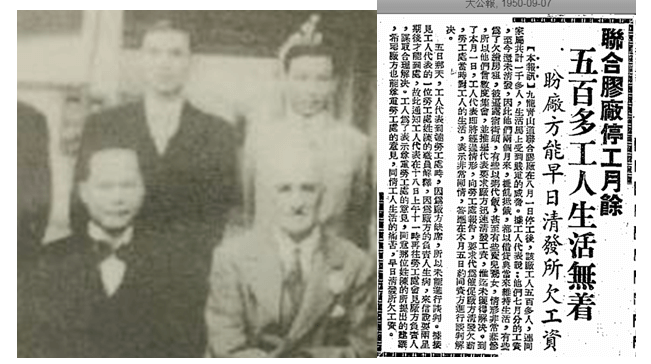 United was one of the few factories which received the rights to export to the UK and according to a Nanyang Siang Pao article in 1948, the firm represented 90% of rubber shoes exported from HK to Australia at the time. Sadly, 1949-50 were difficult years for the HK rubber shoe industry as rubber prices soared coupled with the loss of the mainland market and intense competition. In June 1949, United Rubber announced salary cuts of one third for its 300 workers who were not happy about the new arrangement and threatened to strike. By early July however, the labor dispute was resolved with director Ng Yue-kwong involved in the negotiations. On August1, 1950, United Rubber was unable to make payroll. The factory formally shut down in September and the outstanding salary of roughly HK$100 per worker was owed for over 184 days until January 1951 when it was disbursed from the accounting firm of Wong, Tan & Co. As a company, United Rubber was dissolved in 1953. After the dissolution of United Rubber, Fok did not join another rubber factory but instead spent seven years in a lab developing a new machine to automate the manufacturing of rubber sole canvas shoes. In 1957, he was in the process of registering his patents in the UK and Shum Choy-wah introduced his invention to the press. His wife was the chair of the Parent Teachers Association at St. Stephen’s Girls School in 1959 and his daughters – Cynthia Fok Lawing (霍明珠) and Gloria Fok Cook (霍珍珠) are both accomplished concert pianists and music educators. This article was first posted on 5th November 2018.